Get rotary results with a dual action polisher! Customize the FLEX XC3401 VRG Dual Action 7.5 inch Curved Edge Pad Kit by choosing your own pads! Select any five pads from the options listed below. Choose all one color or mix it up. Any combination of pads is the same low price. The FLEX XC3401 VRG Dual Action 7.5 inch Curved Edge Pad Kit takes dual action polishing to a whole new level with the true dual action motion of the FLEX XC3401 VRG and Lake Country CCS 7.5 Inch Pads. Remove swirls, scratches, and oxidation, and restore a showroom shine with this complete buffer and accessory kit. The FLEX XC3401 VRG Orbital Polisher is a professional grade dual action polisher with more power and a longer stroke length than an average DA buffer. The increased power and range of motion give the FLEX more paint correcting ability while still maintaining the safe, orbital motion of the pad. Because of the increased power, you can use the 7.5 inch pads without bogging down the orbiting head. Novices and professional detailers will appreciate the solid construction, dependable performance, and paint-safe features of the FLEX XC3401 VRG Orbital Polisher. Each bonnet is made of the softest blend of microfiber available! Strong, durable polyester makes up 70 percent while soft, silky polyamide makes up the other 30 percent. Incredibly small fibers are woven together in a split weave that softer, thicker, and plusher than flat weave microfibers. These bonnets fit comfortably over the included 6.5 inch Foamed Wool Pad. 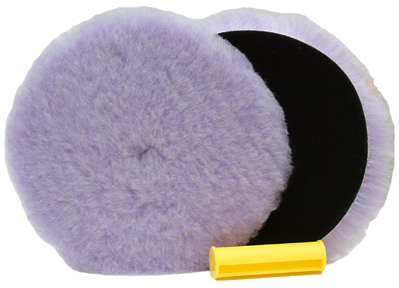 Wash used foam and wool pads in DP Polishing Pad Rejuvenator. Dissolve this 3 oz. packet into 3 gallons of water. 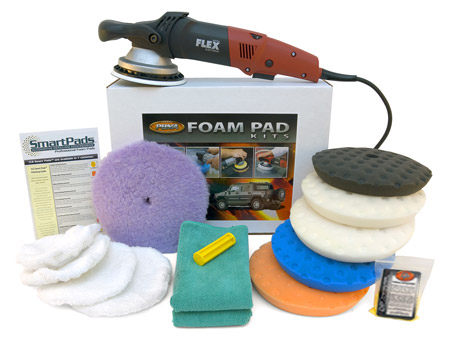 Soak pads and microfiber tools in the solution for up to 15 minutes and agitate if necessary. The citrus cleaner quickly breaks up oily residues within foam and wool to restore the texture of the pads. Let the pads air dry, backing side up. Yellow Cutting Foams 7.5"- Use this pad to apply compounds or polishes to remove severe oxidation, swirls, and scratches. It is the most aggressive and should only be used on oxidized and older finishes. Always follow this pad with an orange pad and a fine polish and then a white pad to refine the paint until it is smooth. Orange Light Cutting Foam 7.5"- Firm, high density foam for scratch and defect removal. Use this pad with polishes and swirl removers. It’s an all around pad that will work on most light to moderate imperfections. Pink Cutting/Polishing Pad Foam 7.5"- This foam is of medium density with the ability to level very fine scratches and very light oxidation. Use light swirl removers with this pad. White Polishing Foam 7.5"- Less dense foam formula for the application of waxes, micro-fine polishes and sealants. This pad has very light cutting power so its perfect for pre-wax cleaners. Gray Finishing Foam 7.5" - Composition is firm enough to withstand added pressure during final finishing to remove buffer swirls. It has no cut and will apply thin, even coats of waxes, sealants, and glazes. Blue Finessing Foam 7.5"– This blue foam pad has soft composition for applying glaze, finishing polish, sealants, and liquid waxes. The soft pad has no cut, making it perfect for applying nonabrasive products evenly. The FLEX XC3401 VRG Dual Action 7.5 inch Curved Edge Pad Kit is an excellent kit for anyone looking to step up from a conventional DA polisher, but who’s not quite ready for a rotary. The FLEX XC3401 provides an increase in power and leveling ability, and the 7.5 inch pads are typically used with rotary polishers. You get the feel of using a rotary without the risk. Take your detailing to the next level with the FLEX XC3401 VRG Dual Action 7.5 inch Curved Edge Pad Kit. A total retail value of $514.40. Save $84.41! Select the HD model from the drop-down menu. The HD version of this polisher is currently out of stock.